Thank you to Kontos Foods for sponsoring this post. All opinions expressed are my own. 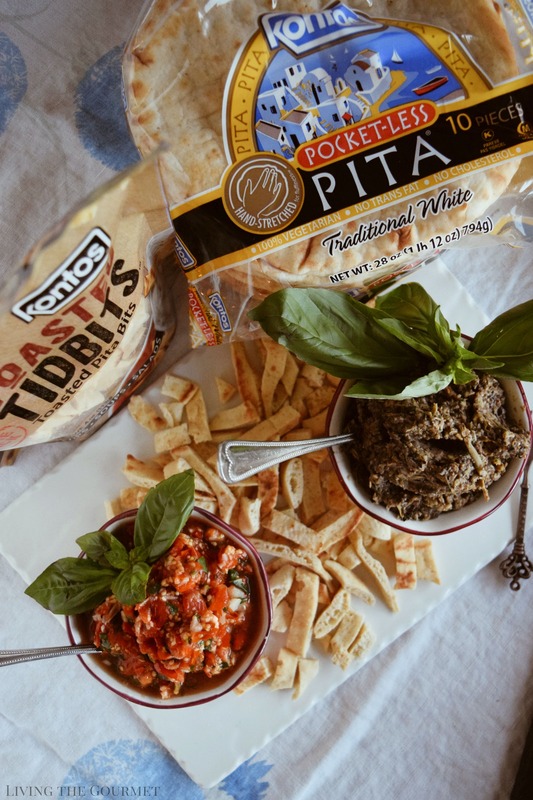 Today we are sharing TWO Mediterranean Spreads for your upcoming fall gatherings featuring the delicious Flatbreads and Toasted Tidbits from Kontos Foods. It’s an easy and light spread for any occasion! It’s a scene I’ve watched countless times. The combination of water, flour, olive oil, baking powder, salt, black pepper being kneaded into a silky dough. “Look at how beautiful this dough is,” I can hear my mother saying. “Feel this dough! It’s gorgeous!” And then, after rolling the dough out, she would proceed to cut the dough into disks using the top of a glass, and then work each individual disk until it was roughly six inches in diameter and as thin as she could manage to get them. Then, a few at a time, she would cook them stovetop on a dry griddle until a veritable ‘leaning tower of flatbreads’ had been assembled, and these would be paired with…pretty much everything. Eggs in the morning, or as the wrap for roasted peppers, or oily fish, with antipasto, or, most commonly, as table bread with dinner. Naturally, those flatbreads are one of my ‘signature’ items here on Living the Gourmet. 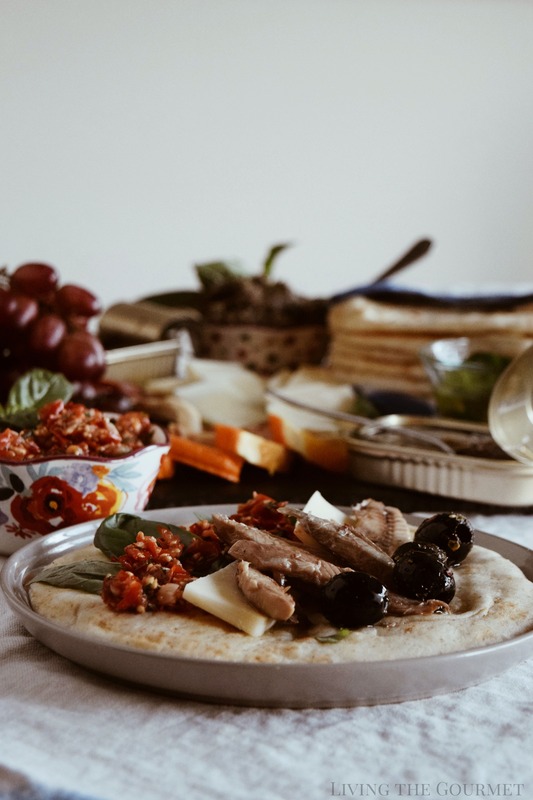 Easy to make (comparatively speaking), and almost foolproof when it comes to the flavor, which you can customize almost limitlessly with seasoning and herb combinations – they are an absolutely delightful addition to virtually any antipasto platter. However, there are times when prepping and rolling dough, and then firing up and standing over the griddle, is either too much of a hassle for a busy night, or just unnecessary to the situation – especially when delicious and versatile alternatives exist that you can use without sacrificing on flavor. After all, if we’re being honest, the idea of ‘relaxed’ appetizers or a ‘social’ antipasto sort of goes out the window after you’ve spent nearly an hour standing over a hot griddle. For example, take today’s antipasto spread. It’s elegant, it’s rustic looking, and it’s ‘Mediterranean’ in flavor from top to bottom. However, it’s also the sort of spread that you actually want to be able to sit down and relax with, whether on your own or with company. It’s ‘comfort food’ in some ways. It’s also stove and oven free. The only equipment you need for the preparation is a cutting board, a knife, a colander, and a food processor. So, why complicate things unnecessarily when flatbreads or gyro pita, of reliable quality, are simply a package away? Naturally, I’m talking about Kontos products, America’s premier maker of high-quality flatbreads and pita – whose phyllo dough I’ve used for countless years for my spinach pie from when my kids were little. They also make other things like panini bread, crepes, nan, and of course the Toasted Tidbits pictured below – which my son ate by the handful, downing most of a package on his own while we were photographing this post. Now, to start things off we begin with the olive and artichoke hearts dip. To prepare this, we simply combine all of the ingredients listed below in a food processor and then process until you reach your desired consistency. I prefer mine quite fine as you can tell from the photo. For the fresh tomato salsa, once again, combine all of the ingredients below in the food processor, and give it a few good pulses. Then place the salsa in a colander, and drain the excess liquid from the salsa. Once that’s done, prep some dipping oil with a smashed fresh garlic clove – you can use either a raw or roasted clove – some salt, freshly ground black pepper, red pepper flakes, dried oregano, and fresh basil. Then season your olives with the ingredients listed below, and your ready set up the platter. Combine all of the above ingredients in a food processor and process to desired consistency. Combine all of the ingredients in a food process and give a few good chops. 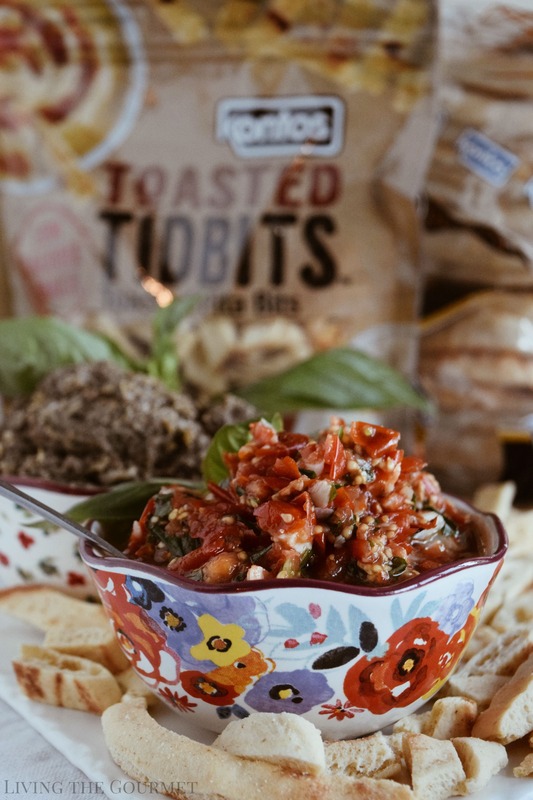 Place in a small serving bowl and enjoy this salsa. 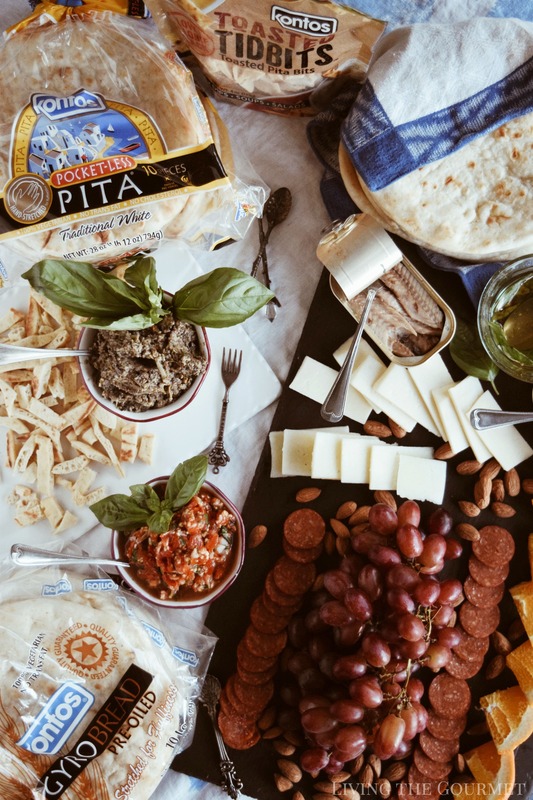 Lay out all the desired ingredients for the antipasto platter on a board or slate of your choosing. Serve it alongside the dip and salsa and serve immediately. After the platter has been set up, you’re good to go. 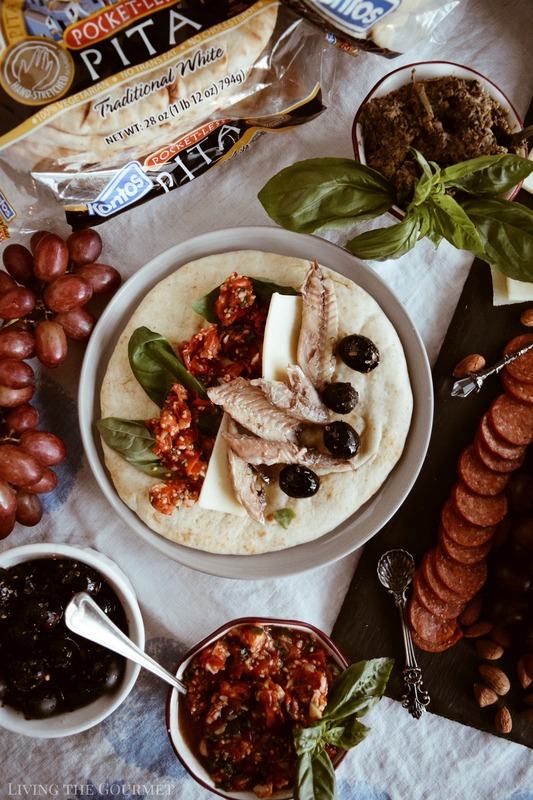 Now, the way I set up my pita was pretty straightforward, begin with a bottom layer of the olive dip, top that with some Asiago, some pepperoni, a few of the seasoned olives, a few chunks of the canned fish, then a drizzle of the olive oil, wrap that up, and bite right in. For more info on Kontos Foods, or for more recipe ideas using their products, check out their website today! I would eat this as my dinner anytime not just an appetizer everything on this looks spectacular! I love making things from scratch...but sometimes (especially when you are feeding a crowd), or are pressed for time, a little store-bought help is great too. Nothing wrong when you can get great products like these. Why not make things a little less stressful in the kitchen!! looks like an amazing combo of flavours! Oh my gosh YUM! I am totally making these! This spread looks deliciously healthy, the only thing I am not familiar with or have never seen on a platter like this is the fish. It would actually work for my family as that is the only protien some of eat. Yummy! I can actually enjoy them as the main :-) Thanks for sharing, Catherine. I love the Mediterranean flavours, especially the sun dried tomatoes and olives. I will definitely try to make the olive and artichoke dip, I can imagine how delicious it is! And I have all the ingredients at home already. These look so good! And they sound super healthy too. I love special dips and spreads. Will have to try for my next party! What delicious looking spreads! 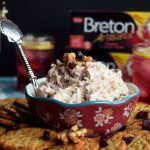 I am a big fan of Mediterranean flavours, my mouth is watering at the thought of making these spreads myself! The artichoke heart and olive oil is always my favorite spread. Very similar to the tepenade. 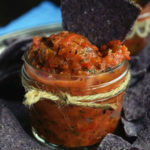 Love cherry tomato salsa too so much sweeter than regular tomatoes. This sounds so wonderful. These two spreads look really delicious and so easy to prepare. I will definitely try to make this and serve with my family I am sure they will like it. 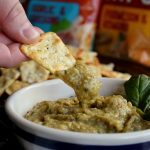 i'd love to try both of these dips! i have a big love for mediterranean food! Now these are some high quality appetizers. I would really like to make these for my friends. OMG this looks so delicious. Everything sounds so good. 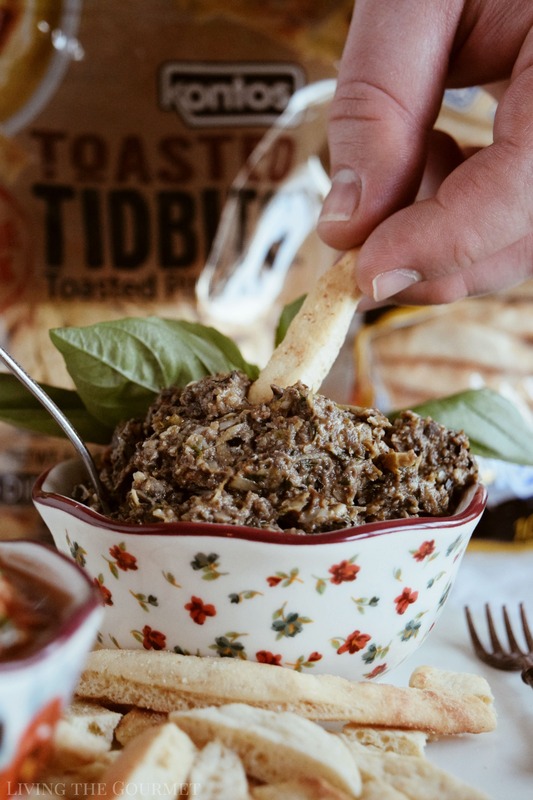 That artichoke olive dip is definitely a must try. Mediterranean food is my newest obsession. These look like super yummy recipes. We love making flatbread -- it is fun to see the results but when you're short on time or entertaining taking some shortcuts is wise. 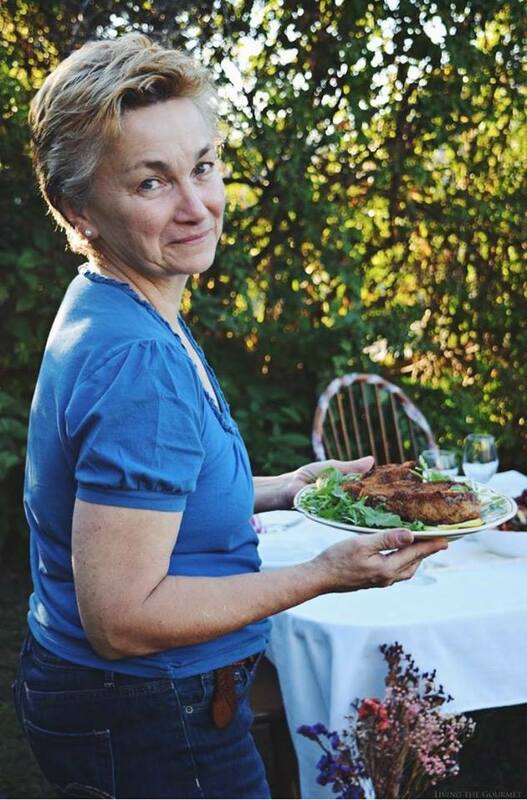 You can spend time on other recipes that you can't readily pick up. I could nibble away on all those love dishes you have. You are one heck of a hostess. Both dips sound really tasty. I like that one has fresh tomatoes and one has sun dried tomatoes, for two very different but very yummy options! Oh my gosh this looks so yummy. Oh my god it's so yummy! I will definitely make these tonight! Now these are some high quality appetizers. Thank you.